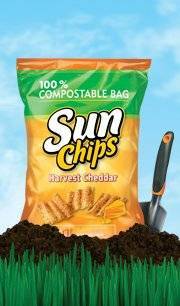 Feel the Noise – SunChips Canada goes Social for Compostable Packaging – StratGo Marketing. Plug-in marketing department services. Score one for the Frito Lay Canada Sun Chips team. After their US cousins abandoned most of the compostable packaging because of consumer complaints about noise (consumers really want to go green, huh? ), the marketing team up north got creative to stay the course. The clever marketing campaign leverages social media (YouTube, Facebook) to engage consumers directly in a friendly, easy conversational tone. Check out this “public service announcement” from Helmi Ansari, Sustainability Leader, at Frito Lay Canada. I’m a fan of using employees in customer communications. Done properly, it’s a terrific communications tool that can differentiate in a big way. A huge key, though, is selecting the right employee. Let’s face it. Not everyone is ready for prime time. You need someone who’s really comfortable, can smile when needed, and who can credibly project enthusiasm, sincerity and believability. Mr. Ansari takes home an A. Engage your customers directly and honestly. This doesn’t have to be boring, though. When possible and appropriate, be creative, engage in an interesting, fun way, and utilize communication mediums that your customers embrace. And keep in mind that marketing change sometimes means manufacturers need to lead the customer forward. Acknowledge and address this challenge in your planning, but don’t be afraid to bring new benefits to market.